Vauxhall is offering buyers up to £2000 off the price of a brand new car when they trade-in their old one. 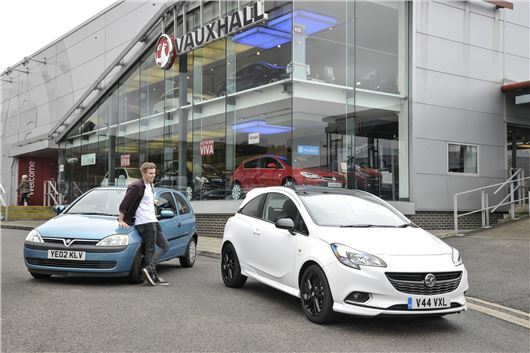 Vauxhall's Scrappage Allowance Scheme applies to the Corsa, Astra, Adam, Meriva and Mokka X. It's eligible on selected new models ordered and registered before 30 June 2017 and can also be combined with existing finance offers, including PCP plans and deposit contributions. However, Vauxhall has stressed that the scrappage programme "is not designed to rid the world of classic cars". Therefore, Autogreen - Vauxhall’s recycling partner - will notify relevant owners’ clubs about cars manufactured prior to 1991, giving them the opportunity to purchase parts before the vehicle is considered for scrap. The Government is already considering a “targeted scrappage scheme” for older petrol and diesel cars. In a draft, published by the Department for Environment Food and Rural Affairs, the Government says it could pay drivers up to £8000 to scrap their car, on the condition they replace it with an electric vehicle. The proposals are part of a wider initiative to tackle rising pollution levels and reduce the number of deaths caused by poor air quality. The "targeted" scheme could run for 12 months and be aimed at diesels registered before 1 September 2015 and petrol cars registered before 1 January 2006. The Government says the scheme could take 15,000 of the most-polluting cars off the road, but hasn't given any indication when the scrappage initiative will start. No thanks. The only way I could afford a new car would be to essentially get myself into medium term debt, by taking out a PCP, Loan or a Lease and i'm not willing to do that during the current wave of economic uncertainty. Juggling a mortgage is hard enough these days without yet another sizeable payment coming out every month, and i'm not willing to increase the number of sleepless nights I already experience, by adding to the daily financial burden of "where is that bill payment coming from" by adding yet another one to the list, and certainly not because some £150k a year politician tells me to . Will the Government be willing to make the monthly payments on my behalf should I lose my job through no fault of my own? - no, I thought not!, so sorry but i'm out. Perhaps these so called, intelligent people in politics should knuckle down, and concentrate on improving the economy, encouraging manufacturing back into the Country and eventually getting everybody on London salaries regardless of which area they live,, instead of worrying about what cars people already drive to work, and penalising them for daring to drive an old banger in order to get to work for an employer who doesn't pay the so called national average of £27k a year!. Far too many people are already living their lives around mounting debt or moving it from card to card, and i'm not sure that encouraging them to add even more to it, is an astute decision!. The jolly boys, making these ill thought out decisions are so far removed from the lives, and struggles of a lot of everyday working people, that they may as well be running the Country by email from Mars. Well said Chris, this is the case for the millions of family motorists running on a tight budget and having to pay extortionate ved rates for older cars, politicians note, not everyone lives in London. 8000 pounds off an new electric car wow where does the other 20,000 come from !! !, I'm sticking with my old banger, a 2003 fiesta 1.4 diesel 75.000 miles one careful owner. when everyone has electric cars and they cost virtually nothing to run, who's going to pay the ridiculous high public transport costs.